Domo makes it easy to integrate data from any source across your organization—on-premise or in the cloud—with a flexible array of data connection options. With Domo, you can analyze, visualize, collaborate on, and make decisions on your data, all in one place. Easily connect your data to Domo. At Domo, we understand that no connection solution is one size fits all. That's why we’ve created a flexible Open Data Platform to make bringing data into Domo as flexible and intuitive as possible. Check out all the ways you can connect data to Domo. Build your own Connector to your cloud API. Create and upload data with the flexibility of using Domo APIs. Write a Workbench plug-in to easily bring your on-premise data into the cloud. Not a customer or partner? 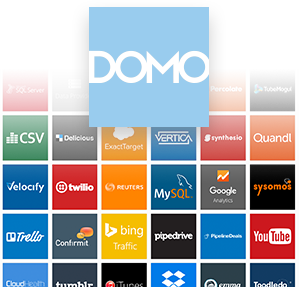 Get all the tools you need to build your own Domo apps for thousands of executives and key decision-makers.